Effective against fleas for up to 4 months Suitable for dogs and puppies over 6 months of age and effective against fleas for up to 6 months. The waterproof Flea Collar by Beaphar protects against infestation of fleas. The drug is continuously released from the band and is distributed through the subcutaneous fat all over the body. Fleas and ticks are safely destroyed. The Flea Collar is about 6 months effective. It fits with its 65 cm length almost every dog​​, as it can be shortened. For external use against ectoparasites, fleas, ticks . 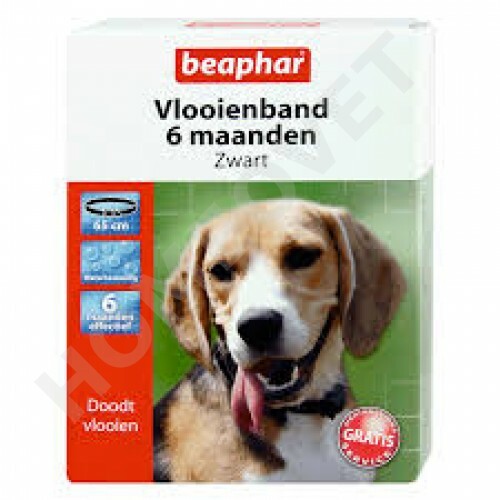 Beaphar Flea Collar is waterproof and odorless. For external use for infestation by ectoparasites dog fleas, ticks .